A big tradeshow calls for major displays, which often need to be shipped off months ahead of time. But what about the smaller-scale events, like street festivals, chamber of commerce mixers, and other local events, that can still generate leads? You can create an A+ display that will make your business look brilliant without having to lug around tons of equipment. As technology advances, more and more banners have the capability for set-up and teardowns that take place in the blink of an eye. These stands, displaying durable vinyl graphics, are not only large enough to get attention when necessary, but also retract to a manageable size for transport. A stand that reaches 79” in height can be as light as 6 lbs., and fit easily into a nylon portable display bag. Tabletop displays are exactly what they sound like, and have an average size of about 52” x 67” x 14”. Able to be as colorful and well lit as their larger compatriots, they are much more compact and are made of lightweight aluminum. That makes them much more compliant when you need to carry them to your car and back. These inexpensive, low-level signs are perfect for a variety of different purposes. While they look great outside your brick-and-mortar business, they also travel well. Even better, a single a-frame sign can have many different messages installed within them. This enables you to select the message you most desire to share with a particular audience and convey it quickly and efficiently. Few tools are as effective in catching the eye and inspiring a sense of fun as inflatables. These portable displays define flexibility, deflating to an easily moveable size when not in use and then blowing up large enough to be non-ignorable when the moment is right. An inflatable item can let someone far across the street know what kind of product you sell, and yet only take up a little bit of space in your vehicle’s trunk. 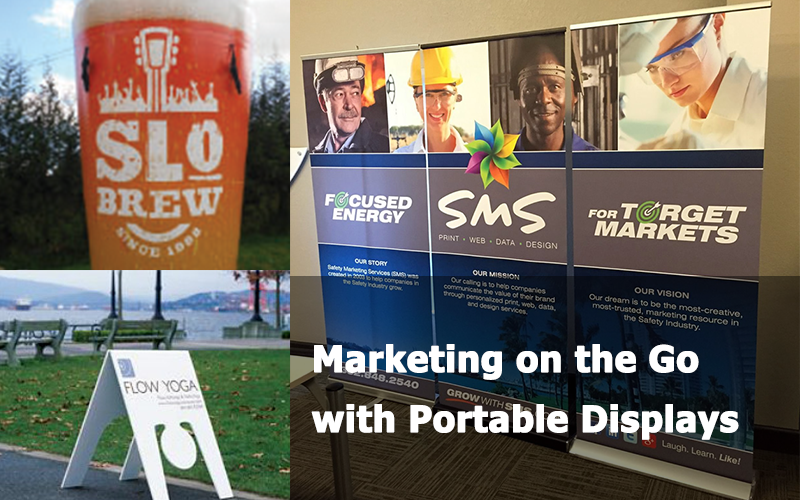 With a portfolio of portables such as retractable banners, tabletop displays, a-frames, and inflatables, you can be ready for any last-minute marketing opportunities that come your way. And of course, the pros at eGenoa are always happy to help you find the right display for your needs.